As I’m sure you’re familiar, Customer Focus Enterprise requires an active licence to allow you onto the system. When this expires, it’s essential you get it renewed as soon as possible to ensure maintained access to your system. The process to get this process completed is actually quite simple, provided you know where to look. The following help sheet aims to make this process as painless as possible. If you find yourself having difficulty after consulting this help sheet, our support team are on hand during all typical business hours to assist you. You need to ensure that both your company firewall & security software on your PromoServe/CustomerFocus/Transaction server machine have been adjusted to allow the following access. This is required for the PromoServe activation routine to work correctly and extend the license period of the PromoServe software. Once these configuration steps have been completed, Enterprise will be able to check for and renew licences automatically (provided internet access is maintained on the day it checks for licence renewal information). If for whatever reason the process is not completed automatically, you can follow the steps below to complete a manual renewal. When you try to log into Enterprise once your licence has expired, you will receive a warning message notifying you as such. 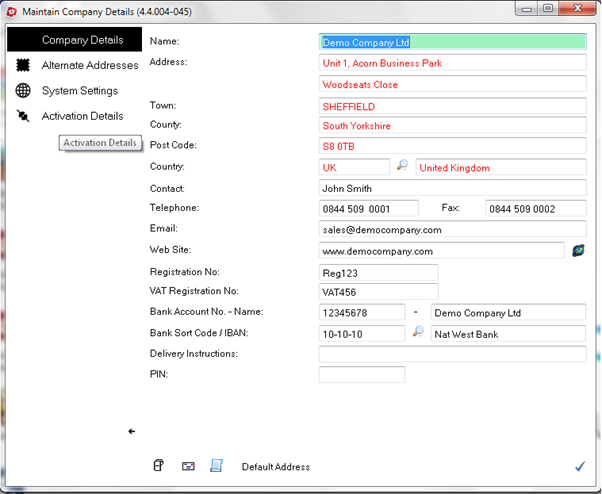 Okaying this popup will produce the Company Details screen. From here, you want to navigate to the ‘Activation Details’ tab on the left-hand side of the screen. This effectively states that you should ensure that you have paid for your licence and updated your software to the newest version before requesting a code. Once you’re sure these steps have been taken, click the right-facing blue arrow in the bottom right of the window. You will next be greeted by a licence agreement. Read through this at your own pace. If you’re happy with the terms outlined, click the ‘I agree’ checkbox underneath, which will unlock the ‘next’ arrow in the bottom-right. 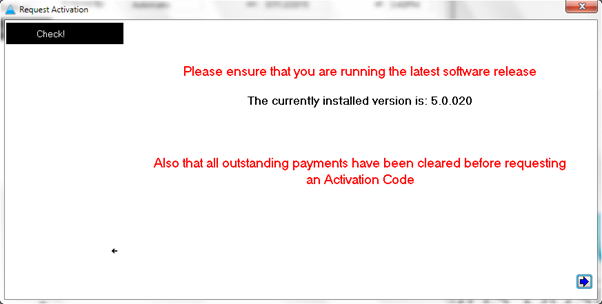 Next you will see a screen stating ‘Reason for Requesting Activation’. Select the option that best relates to your reasoning, then click the ‘Send Request’ button underneath. 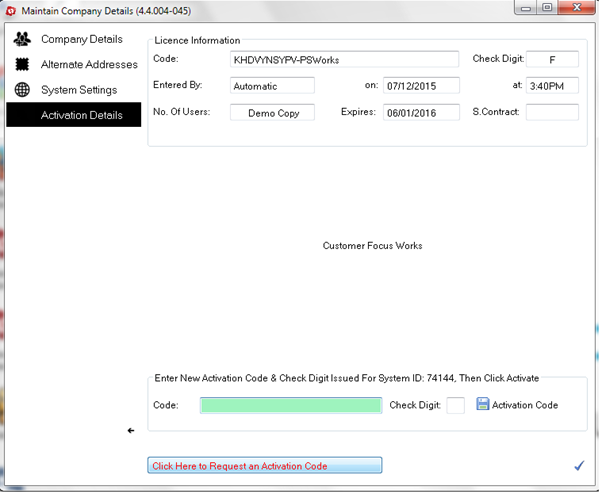 This will automate the process of generating a licence request and sending this to our accounts department to action. If for whatever reason the system is unable to automatically issue the request, a popup will appear to notify you of this and you will be returned to the Request Reasoning window. However, you will note that the mail, print and fax icons to the right hand side are now unlocked, whereas the Send Request button is greyed out. This allows you to send the request by email or fax as an alternative, or produce a printed version of the request that you can send by post. Following this, the request for activation has been successfully issued. You should hear from one of our team shortly after receipt of the request, to provide the code you will need to enter into Enterprise. 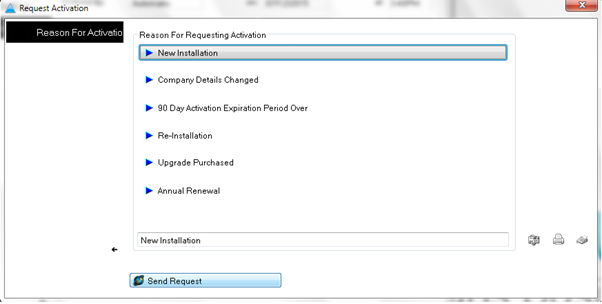 When this code is received, you need to enter this into the end of the Activation Details tab in Company Details. Once entered, click the ‘Activation Code’ button with a save icon alongside it, to the right of the activation code, to authenticate your system and restore access. With this you have successfully renewed your Enterprise licence!